Gettysburg has always been known as an affordable destination. With inexpensive lodging, dining and attractions, it’s a great destination for a variety of travelers, especially families. And there’s no price more affordable than free. The region boasts a variety of free activities, museums and tours that make the trip enjoyable and give visitors some extra money for a nice dinner or souvenir. We’ve compiled our list of free experiences in and around Gettysburg. Whether you are on a low budget or not, these free experiences in and around Gettysburg are worth discovering. Gettysburg National Military Park draws nearly more than a million visitors annually and it’s not hard to see why. Considered one of the country’s largest history classrooms, the park spans 6,000 preserved acres and features 1,400 monuments and markers, and 400 cannons. There are many ways to explore the park at no cost. Visitors can lace up and take advantage of the battlefield’s many hiking trails or hop in the car or on a bicycle for a self-guided tour on 40 miles of park roads. Along with history, there are many aspects of nature that can be enjoyed on the battlefield as well. The Gettysburg region features a variety of parks in and around Gettysburg, including state parks like Caledonia, Codorus and Pine Grove Furnace, each featuring a variety of hiking and biking trails, fishing and picnicking. Just outside Gettysburg is Strawberry Hill Nature Preserve, a 600-acre park for hiking and spotting wildlife. On your next trip, take a short drive and enjoy an afternoon with Mother Nature. Destination Gettysburg has put together a collection of self-guided tours that enable visitors to explore on their own at their own pace. The Scenic Driving Tour and the Historic Conewago Valley Tour take you out of town and into the great countryside of Adams County, Pa. Along the way, you’ll find orchards, farmer’s markets, antique malls and plenty of picturesque stops. Our Downtown (Gettysburg) Walking Tour and New Oxford Historic Walking Tour give our visitors a chance to stretch their legs, learn a bit of history and an opportunity to explore shops, galleries and diners along the tour. Visitors to the historic train station have the chance to step into President Abraham Lincoln’s shoes. When President Abraham Lincoln arrived in Gettysburg to deliver what would become known as the Gettysburg Address, this small Pennsylvania town was in the midst of a massive cleanup effort after the Battle of Gettysburg just four months earlier. The train station – Lincoln’s first stop in Gettysburg – explains that story and demonstrates the world the 16th president would have seen when he stepped off that train on Nov. 18, 1863. Have you ever wondered how one of your favorite salty snacks are made? At Utz Potato Chip Factory, you can find out. At the 600,000 square foot facility, visitors can engage their senses of sight, smell and taste as they watch the potato chip-making process from start to finish from an observation gallery that overlooks the production room. The Eastern Museum of Motor Racing is the result of a small group of people with a passion for early American motor racing and a desire to preserve and share that period of time. The museum highlights every era of motor racing through an extensive display of memorabilia and even boasts a motorsports research library. The EMMR adds new cars and display items often, so there is always something new to explore. For many visitors to Gettysburg, Mister Ed’s Elephant Museum is as much of a must-stop attraction as the battlefield itself. Yes, the candy comes with a cost, but to see one of the largest collections of elephant figurines in the world won’t cost you a cent. What started out as a simple wedding gift has turned into a nationally known museum with more than 10,000 elephants on display. The uniquely round shape, rich history and stunning surroundings of the Round Barn and Farm Market make it a sight not to be missed. Built in 1914, the structure is one of only a handful of round barns that are still around today. Located in the heart of the Pennsylvania Fruit Belt, this rare building has become one of Adams County, Pa.’s most popular landmarks. Step inside and you’ll see that the barn now houses a farm market – selling homegrown fruits and veggies, small-batch canned and baked goods and seasonal gifts and décor. Perhaps one of the most recognized national cemetery’s, Soldiers’ National Cemetery is the final resting place for the more than 3,500 Union soldiers who, as President Abraham Lincoln put it, “gave the last full measure of devotion” to their country during the Battle of Gettysburg. Visitors can pay their respects by taking a self-guided walking tour of the site. The cemetery is also the location where President Lincoln delivered his legendary Gettysburg Address, at the dedication ceremony four and half months following the battle. From history, to potato chips to elephants, some of Gettysburg’s most unique adventures come at no cost. 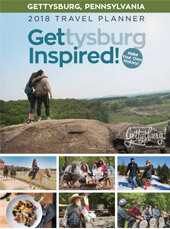 So be sure to check out some of these free attractions on your next visit to Gettysburg, Pa.